If you need a nice ride in the beautiful city Tianjin, just simply contact us now to get our BEST QUOTES and GREATEST SERVICES today! Car rental serivice provider in Tianjin city China ! We drive your way in Tianjin! 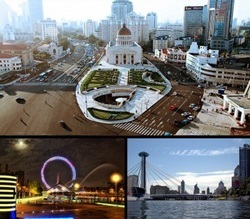 Tianjin is located in Northern China along the coast of the Bohai Gulf, Surrounded by Hebei on all directions except for the sea and is bordered by Beijing to the northwest, it lies at the northern end of the Grand Canal of China, which connects with the Yellow River and Yangtze River. one of the five national central cities and also the sixth largest city in China in terms of Urban population. Tianjin features distinctive four seasons, monsoon-influenced climate, typical of East Asia, with cold, windy, very dry winters reflecting the influence of the vast Siberian anticyclone, and due to the monsoon,it is hot, humid in summer. As one of the four municipalities directly under the central government, it is the important heavy industrial city in China's coast and also the biggest shipping port in Northern China . It is also the modern industrial base that has strong basis and complete kinds.The main industries covers: Machine and electron, Textile, chemistry, metallurgical industry and petroleum industry etc. Tianjin is on its way to becoming a more modern coastal city and an important economic center in northern China. Shanghai Car Rental Service will be very honored to have the opportunity to serve you in Tianjin with our great limousine services, we will insure a hassle-free, most comfortable trip no matter you are traveling Tianjin for official business visits or personal tourists. All our drivers are from local and they are all licensed, well trained and with more than 6 years’ experience in serving our foreign customers, they are also quite familiar with the routes in Tianjin and other cities in Hebei Province ,can easily drive you wherever you want. ◆Tianjin airport transfer services ,hotel pick up and drop off . ◆ Tianjin railway /bus station/ Cruise port/terminal transfer services . ◆Grand transportation or transfer /shuttle services for Fair/ Event /Exhibitons in Tianjin regions ( Convention center to hotel and hotel to convention center) ( MPvS, Luxury Sedan , buses and coaches are availale for such services ). ◆ Tianjin Daily Limousine or car rental services (chauffer services) for short term period, include Tianjin Business tours or factory visits to neighborhood cities in Shjijiazhuang,Baoding,Beijing and other cities in Hebei province . City sightseeing tour sedan /mini van/mini bus/coach services for individual or group travelers. ◆Long-term car lease for individuals or cooperates in Tianjin.